Every so often iPhone/iPad users enter recovery boot and don’t have a clue what to do. There seems to be no way to exit recovery boot and you’re stuck with no option but to restore your device with iTunes. To most users getting stuck in recovery mode is no less than a nightmare. There are, however, many users who look to enter recovery mode deliberately to restore their iPhone/iPad. A new user or any user as a matter of fact can enter recovery boot once in a while. You may enter recovery boot if you try to delete Jailbreak from your iOS device without knowing how to do it properly. If you go to Settings > General > Reset > Erase All Content and Settings on your jailbreak device, it’s a sure shot recipe to enter recovery boot. Another reason that may lead you to recovery boot is following some random steps of instructions from a tutorial without any knowledge of what you’re doing. This way your iPhone will enter recovery boot to fix your device software that you’ve just made unstable. Recovery boot is a feature of iOS that helps you restore your iPhone or iPad when something goes wrong. It is not your enemy but saves your device from breaking down. 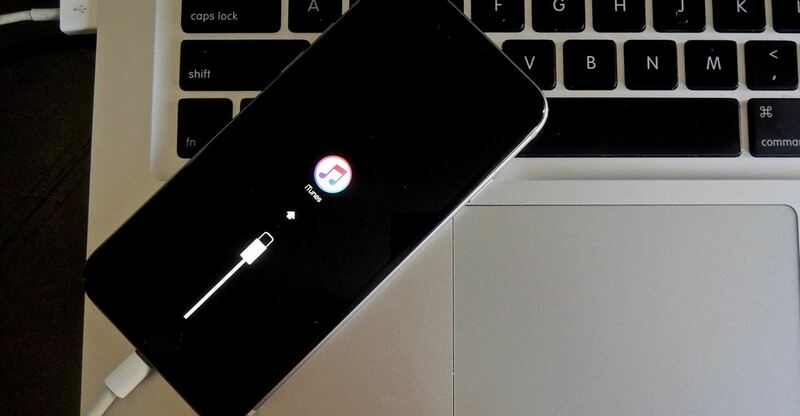 It enters it in recovery mode and lets you restore your device using iTunes. However, if you want to exit recovery boot without restoring your iPhone/iPad you can use one of multiple free softwares such as Tiny Umbrella, RedSn0w, ReiBoot and RecBoot. Apart from exiting recovery mode, these softwares also help users to enter recovery boot. When you jailbreak an iOS device, upgrade or downgrade a device or do any technical stuff with your iOS device, anything can go wrong. This means that your device is broken. Now you will need to restore your device with iTunes. Restoring with iTunes when you enter recovery mode means you’ll lose all your data and your iPhone/iPad will be reverted to factory settings. But there are times when you need to enter recovery mode to fix your device. If your iPhone is not responding and is stuck on a black/blank screen, you’d need to enter recovery mode to save your device and data. 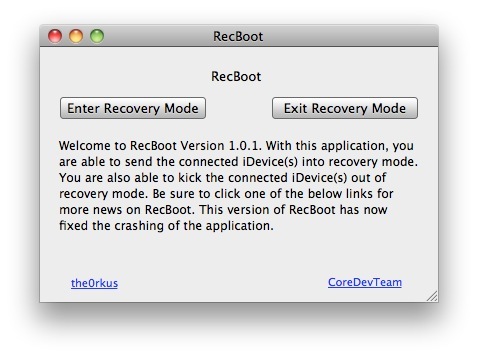 RecBoot is software that lets you enter recovery boot as you like. It works for both Mac and Windows and lets you put your iPhone in Recovery Boot. You can use RecBoot to enter recovery boot even without power or using home buttons. It doesn’t require you to have a lot of technical knowledge to use RecBoot. RecBoot has a simple and easy to use interface for nontechnical person. It not only lets you enter recovery boot but also helps you exit recovery boot afterwards. Use RecBoot to fix 1015 restore from iTuens as well. Download the latest version of RecBoot for Windows or Mac. Allow it to download and install. There are two options only: Enter Recovery Boot / Exit Recovery Boot. Connect your iOS device with the computer and choose the option you need. If your iPhone or iPad is stuck on a black / blank screen, you need to enter it to recovery boot. The device will turn off and enter recovery boot. Now select the exit recovery boot to get it out of recovery boot. That’s it! You will be able to enter and exit recovery boot with RecBoot without any errors because it’s very stable software. To enter recovery boot I use Tenorshare ReiBoot, what do you think of it?